The Rear Trunk Spoiler is one of the simplest mods you can do to the exterior of your car that will give your car that completely different look. Not only are spoilers meant for great looks, they also help with the aero dynamics of the car by lowering drag, Or helping to put more downforce on the car making sure that the wheels stay grounded for maximum traction. Condition: 100% Brand New Color: Black Style:Single Deck Material: Made of high quality CNC machined T6061 aluminum. 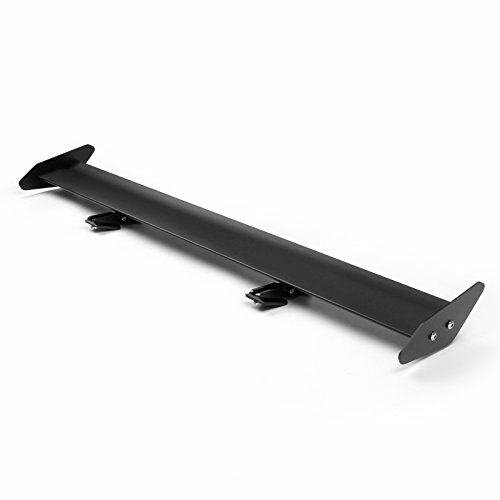 Length x Width x Height: 111x7.5x19cm Fitment:Universal Fit for most of Hatchback Cars with a rear trunk Package included: 1 x Wing Spoiler Comes With All Screw, Bracket And All Accessories! Made of High Quality Lightweight Aluminum for Extreme Strength. 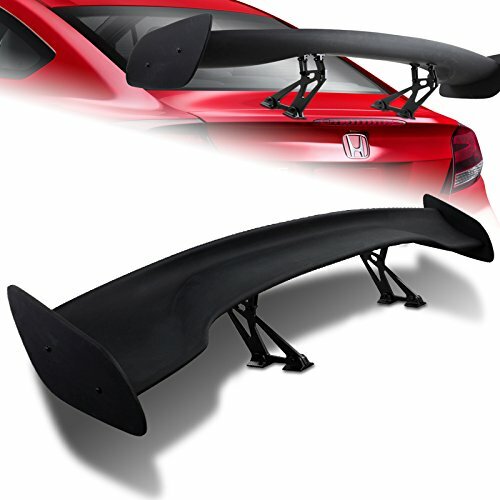 Latest Design Wing Spoiler Completed Kit, Improve Handling And Make Tail More Stable in High Speed. Powder-Coated for Highest Durability. Adjustable Angles for Customizable Usages, Efficiencies and Appearances. Enhances Aerodynamic. i.e. Reduces Drag, Increases Fuel Efficiency, Reinforces Downforce, Traction and Stability. Bolt-On Design, Easy to Install. No Instructions Included, drilling is required for installation, Professional Highly Recommended. 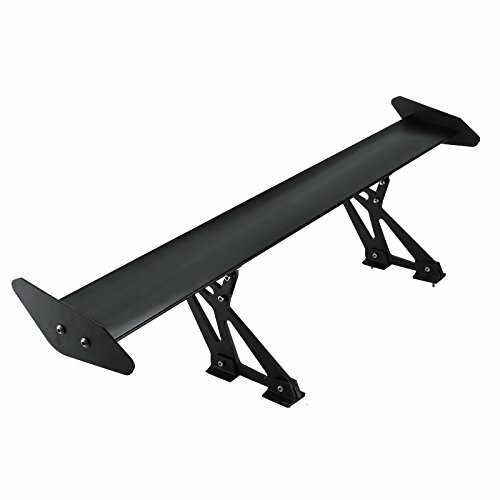 The Rear Trunk Spoiler is one of the simplest mods you can do to the exterior of your car that will give your car that completely different look. Not only are spoilers meant for great looks, they also help with the aero dynamics of the car by lowering drag, Or helping to put more downforce on the car making sure that the wheels stay grounded for maximum traction. Condition: 100% Brand New Color: Black Style:Single Deck Material: Made of high quality CNC machined T6061 aluminum. 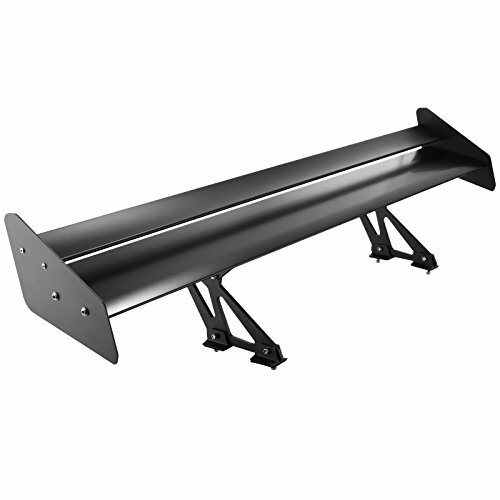 Size:Like the picture show Fitment:Universal Fit for most of Hatchback Cars with a rear trunk Package included: 1 x Wing Spoiler Comes With All Screw, Bracket And All Accessories! Made of High Quality Lightweight Aluminum for Extreme Strength. Latest Design Wing Spoiler Completed Kit, Improve Handling And Make Tail More Stable in High Speed. Powder-Coated for Highest Durability. Adjustable Angles for Customizable Usages, Efficiencies and Appearances. Enhances Aerodynamic. i.e. Reduces Drag, Increases Fuel Efficiency, Reinforces Downforce, Traction and Stability. Bolt-On Design, Easy to Install. No Instructions Included, drilling is required for installation, Professional Highly Recommended. Brand new in original packaging. Product will be received exactly as same as in picture. 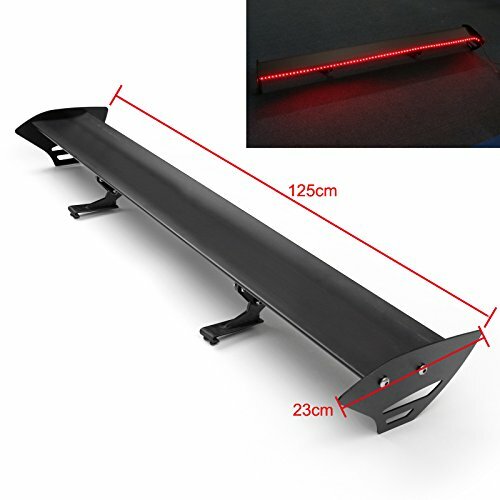 Racing style adjustable double deck rear wing spoiler. Light weight and durable, Improve your exterior style. High quality C.N.C machined aluminum, painted in black already. Dimension: length 52.25", width 10" height 11" Comes with adjustable wing, base to tallest point n wing: 10.5"~11" Install tool are included (brackets and screws). Fitment : Fits for vehicle with flat trunk. 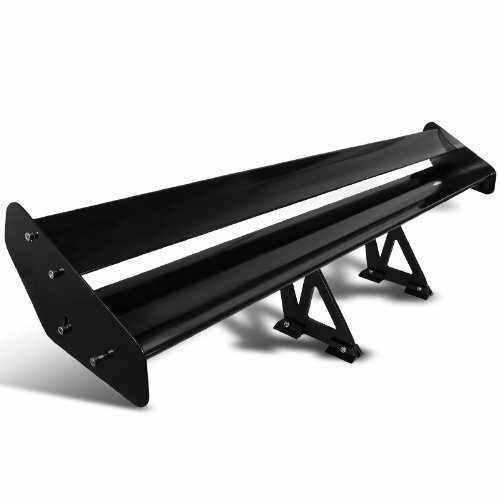 43.3Inch Adjustable Angle Black Single-Wing Aluminum GT Style Spoiler Introduction : This Universal Aluminum Single Rear GT Wing Spoiler made of high quality lightweight aluminum for extreme strength. Powder-Coated for highest durability. Adjustable angels for customizable usages, efficiencies and appearances.It is used in stabilizing the vehicle at its high speed. One of the simplest modification on the exterior of a vehicle, which gives it a completely different sports look, is the rear trunk spoilers/ wings. 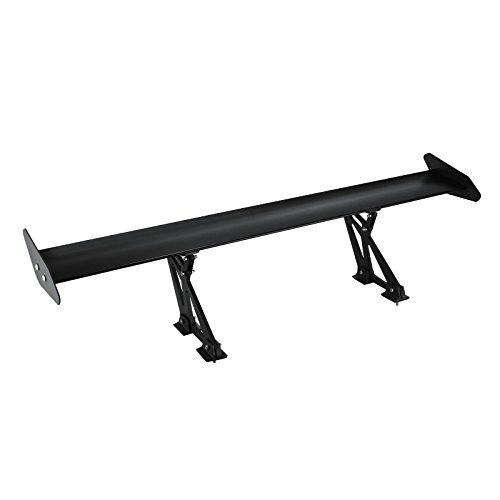 Technical Parameters: Material: High quality lightweight aluminum Color: Black Style: Single deck Overall height: 8" Overall length: 43.3" Overall width: 4.5" Distance Between two brackets: 19.6" Packing size: 44"x3"x5" Packing weight: 6.6lbs Features: - Light weight design (Made of aluminum) - Powder-coated for highest durability - Improves the exterior appearance of a vehicle - Adjustable angels for customizable usages, efficiencies and appearances - Effective Diversion wind direction, enhance the stability of driving adjustment Advantages: - Maintain traction - Increase fuel efficiency - Added visiblility - Reduce weight - Create the stylish look FITMENT: Universal fitment for most hatchback vehicles. Copyright © Wholesalion.com 2019 - The Best Prices On Aluminum Rear Wing Spoiler Online.